"Mythical Beast" is an archetype of Spellcaster monsters that debuted in Structure Deck: Spellcaster's Judgment, with further members and support introduced in the Booster Pack Extreme Force. 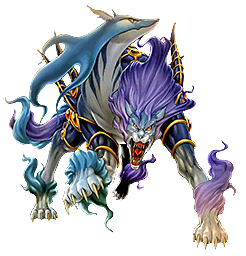 This archetype consists of "Mythical Beast Cerberus" and Pendulum Monsters based on it. "Gazelle the King of Mythical Beasts" and "Chimera the Flying Mythical Beast" are not members of the archetype. However, because support for this archetype only works on Pendulum Monsters in the Pendulum Zone or Extra Deck, and Effect Monsters in the Main Deck, neither will be an issue. Their effects revolve around gaining Spell Counters and using them to pay for effects. Each Pendulum Monster that is a member of this archetype has a Pendulum Scale of 4 and has a Pendulum Effect that can only be activated if you control no cards in your other Pendulum Zone, and which destroys the card itself as part of its effect. These characteristics let them be played similarly to Normal Spell Cards to help build up Spell Counters on the "Mythical Beasts" in your Monster Zones. This page was last edited on 22 April 2019, at 04:03.